A step up from stereo speakers, but this is a confused product that’s very reliant on volume and bass to create an impression. Great for games, maybe not for serious listening. 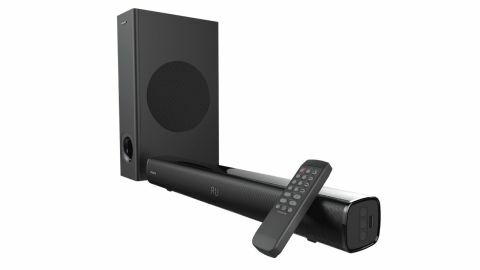 Soundbars are a popular way to improve on your TV’s built-in speakers, but in the PC world a pair of chunky stereo speakers still sit on many desks. Creative’s Stage 2.1 hopes to be an upgrade to those speakers, offering a good range of inputs as well as a subwoofer for that all-important shotgun bass kick. It’s a bit of a confused product, apparently unsure about which room in the house it wants to live in. There are useful inputs such as 3.5mm aux in, Bluetooth (version 2.1, pleasingly, with EDR), and a USB port so it can be used as a standalone system with a flash drive full of MP3s, plus potentially making use of the S/PDIF lurking at the back of most gaming PCs (an optical cable isn’t included), and an HDMI Audio Return Channel more suited to being under a TV. The bar is short, barely as wide as a 24in 16:9 screen, meaning you don’t get as much stereo separation as you would with discrete speakers, and while the total peak output of 160W sounds good, most of that is accounted for by the sub, leaving only 20W each for the ends of the main unit. That’s not bad for something you’ll be facing directly and be within arm’s reach of, however, but don’t go expecting this soundbar to double as a living room system—it’s just too small—although the lack of width and depth will be helpful to those with tight desk arrangements. This is most definitely a computer speaker. The power lead is captive and upsettingly short, so banish any thoughts of installing the bar above your monitor unless you’ve got plug sockets on your desk or halfway up the wall. Likewise the included 3.5mm cable, which at a metre in length tethers the bar too close to the back of our PC for our liking. At least this lead can be replaced with a longer one, unlike the power lead, and the subwoofer cable is also captive but a more reasonable length, allowing a bit more breathing room. That cable is the only one you’ll run for the sub, which doesn’t have its own power supply. The bass speaker is tall and thin, rather like a PC case itself, with a bass reflex port at the bottom. It has no controls on it—everything in this system is handled by the remote. There are basic on/off, input switching, and volume controls on the end of the speaker along with the USB port, but that’s it. The remote—which doesn’t come with batteries—gives you control over EQ, bass and treble levels as well as master volume. It also allows you to switch between inputs and control music playing through USB and, if compatible, Bluetooth. It’s a faintly flimsy feeling thing, but gets the job done. The speaker also comes with wall mounting points built in, plus two screws and a pair of wallplugs that glory in the name of a ‘wall mounting kit’. The sound, once you’ve got it connected up and working, is actually pretty good. The benefits of a dedicated subwoofer cannot be denied, and as long as you don’t try to fill a large room with sound it produces clear trebles and mids, plus some thumping bass. The speaker unit is just wide enough that, sitting close to it, you get a stereo effect and plenty of power, once you’ve fiddled with the controls enough to get the sound to your liking. It’s not a subtle system, however, sounding better when producing the noisy clatter of Far Cry New Dawn than it does hooked up to Radio 3. At low volumes the bass falls off a bit, leaving things sounding a bit thin. Creative has been a longstanding fixture of PC sound equipment, from 8bit ISA cards in the late ‘80s onwards. This soundbar system is a solid attempt at turning your PC into a great-sounding entertainment machine, especially at the price. Creative’s stereo speakers in this price range, such as the T12 Wireless, lack some of the Stage’s inputs as well as missing an entire subwoofer, and can’t produce the same thickness of sound. The Stage is superior to similarly priced stereo speakers, and absolutely melts the tiny speakers sometimes found built into monitors, but is quite reliant on its subwoofer for its sound quality. If you’re looking for something to go under the TV in a large room, this probably isn’t it, but under a monitor most other soundbars would be too wide. For gaming purposes or watching Michael Bay movies, however, especially if you can crank it up, it produces a fantastic noise.